For more information about this Proven Safety Countermeasure, visit the Office of Safety's Signalized Intersections: An Information Guide's Vehicle Timing –Vehicle Clearance.. Source: NCHRP Report 731, Guidelines for Timing Yellow and All-Red Intervals at Signalized Intersections. At a signalized intersection, the yellow change interval is the length of time that the yellow signal indication is displayed following a green signal indication. The yellow signal confirms to motorists that the green has ended and that a red will soon follow. 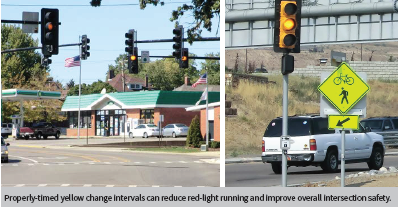 Since red-light running is a leading cause of severe crashes at signalized intersections, it is imperative that the yellow change interval be appropriately timed. Too brief an interval may result in drivers being unable to stop safely and cause unintentional red-light running, while too long an interval may result in drivers treating the yellow as an extension of the green phase and invite intentional red light running. Factors such as the speed of approaching vehicles, driver perception-reaction time, vehicle deceleration rates, intersection width, and roadway approach grades should all inform the timing calculation. Transportation agencies can improve signalized intersection safety and reduce red-light running by reviewing and updating their traffic signal timing policies and procedures concerning the yellow change interval. Agencies should institute regular evaluation and adjustment protocols for existing traffic signal timing. Refer to the Manual on Uniform Traffic Control Devices for basic requirements and further recommendations about yellow change interval timing.